Brenda Bennett passed from this life on April 10, 2019 to her Eternal Rewards by the authority of the Lord Jesus Christ. She was born on January 17, 1944 to Floyd Letroy and Louise Berneice (Loveall) Percell in Durant, OK. She moved to Oklahoma City in 1950 and attended Mark Twain Elementary School; upon graduation from there she went to Central High School. When Brenda was in the 11th grade, she decided she wanted to marry and start a family. She married Larry Baucom and they were blessed with two children before they divorced. She then was joined in marriage to Clyde John with the blessing of one son before divorcing. She then married her husband Don on December 19, 1981. Brenda worked for Cattlemen’s Café for 26 years until it changed hands. 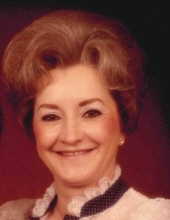 She then worked for Braums in Oklahoma City and Durant, OK. She was an avid Polka Dancer at Czech Hall and went to many out of state Polka festivals in eight different states as well as Oklahoma. She was an above average quilter and seamstress for many years until her health failed and she had to retire for good in all things. Brenda suffered from many illnesses which ultimately led to her passing. She will be remembered as a hard worker and a wonderful wife of many years. She was preceded in death by her parents, and brother Larry Bruce Percell of Bennington, OK. She is survived by husband Don Bennett of Yukon, OK, daughter Tana Baucom and George of Bennington, step daughter Robbie Elswick of Yukon, son Jon and wife Cynthia Baucom of Durant, son Alan and wife Kristi of Mustang. Also by sister Joann Robinson of Bennington, sister Patricia and husband Danny Griffin of Yukon, many grandkids and great grandkids, nieces and nephews. Funeral services will be held on at 2:00pm on Monday, April 15, 2019 at McNeil’s Funeral Service, Mustang, OK with interment in the Mustang Cemetery. We wish to thank all who have called and visited Brenda during her illness from Alzheimer’s. We wish to thank Dr. Nestor Pinaroc for his early diagnosis of her illness, Mercy Health Center unit for their assistance with her and the entire staff of Integris Hospice Unit for their endless attention, we thank God for all that cared for our Brenda. To send flowers or a remembrance gift to the family of Brenda Kay Bennett, please visit our Tribute Store. "Email Address" would like to share the life celebration of Brenda Kay Bennett. Click on the "link" to go to share a favorite memory or leave a condolence message for the family.